West Coast pianist and singer Roy Thomas Dodson III is a bit of a cult figure. His large handful of 45s are all really sought after – you won’t find them easily and the cheapest (the Uptown single) will set you back about $100. Why is this? Well for a start the Northern soul guys go a bundle on several of them and deep obsessives like me treasure one or two as well. The fact that he’s a first rate, highly demonstrative vocalist could be a factor too. I’ve already written about his involvement with the Experts on these pages and now I’ll cover his own name efforts as well. Although it is nigh on impossible to date the two releases on his own name label I would place them musically in the early 60s - maybe before the Skylark release or maybe after it. “Love Love Love” is good uptempo R & B with Tommy’s electric piano based on the changes in Brother Ray’s “What’s I Say”. The flip Only Time Will Tell is a real beauty – not just for Dodson’s superbly effective tenor vocals but also for the gentle male chorus and the whole feel of the piece. Doo-wop meets deep soul. 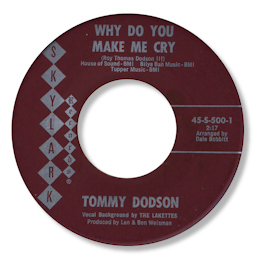 The other Dodson 45 – which sounds as though it was cut at the same session - features Joanie Lyons as a second voice in two storming R & B duets. “I Need Your Love So Bad” isn’t the Little Willie John song but a slow sad blues with some fine changes and “Don’t Lie To Me” being a foot tapper of some style. The Skylark 45 is a very good double sider. “It’s Got To Be Love” is a beautifully organised blues ballad with Tommy’s piano well to the fore and it also features a hi-octane performance from the man. Why Do You Make Me Cry is in a very similar style and tempo to the other side and is equally good. Essential stuff for anybody who likes heavy R & B. 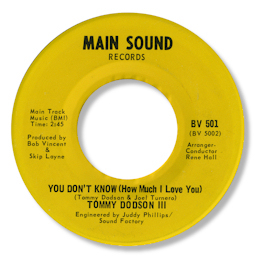 The Uptown 45 moves us firmly into soul territory but Tommy’s powerful and very well-modulated vocals still deliver the goods. I’m very fond of the hard hitting “Mind Reader” and the pounding "One Day Love” isn’t bad either. But both sides can’t touch his Main Sound 45. “Cooperate” is high quality LA uptempo soul funk – think Roger Collins for example, but it can’t hold a candle to the superb You Don’t Know (How Much I Love You) which has a deserved reputation amongst deep enthusiasts. The emotional strength of this track is high thanks to Tommy’s flexible and compelling vocal and his lovely piano fills. Just check out those falsetto shrieks. The way the horns come in and out, and the cooing of the female chorus make this a side to drool over. Quite wonderful. 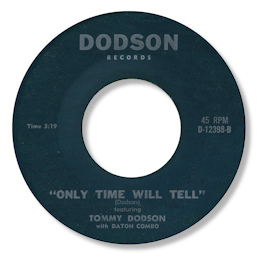 Note ~ Is this the same Tommy Dodson who had a gospel LP released on Dodson entitled "Follow Me" in 1982? UPDATE ~ Davie Gordon writes to confirm that indeed it is the same guy. I'm grateful as always for Davie's knowledge and expertise. NEW UPDATE ~ Jeff Beckman writes to say "Minor point regarding Tommy Dodson is that his duet with Joanie Lyons on Dodson: "Don't Lie To Me" is an early version of Joanie Lyons & The Hitchhikers on Star 701: "You Lied." I'm grateful to Jeff for taking the time and trouble to get in touch.